the head of the blood jacket from Killer Species: Out For Blood. Size: Their Wingspan were less than a foot long. Weight: Each one weighed only a few ounces. Appearance: They had beady eyes and large fangs. They had six spiny legs. Their stinger were dull, but they were still tough to pierce skin more than once. There body coloring is like the bald-faced hornet, but the mouth and fur has the coloring of the vampire bat. They had spindly wings. Their wings are a mix with the Vampire Bat's Wing and the Bald Faced Hornet's Wing. It is the same form of the Vampire Bat's But Its Colored As the same as The Bald Faced Hornet's. Movement: They flap their wings and hopping about, they have impossible speed. Behavior: Bats colonies and hornets live alike in each member, different duties bats shared blood with colony members. Hornets are protective to their nests. 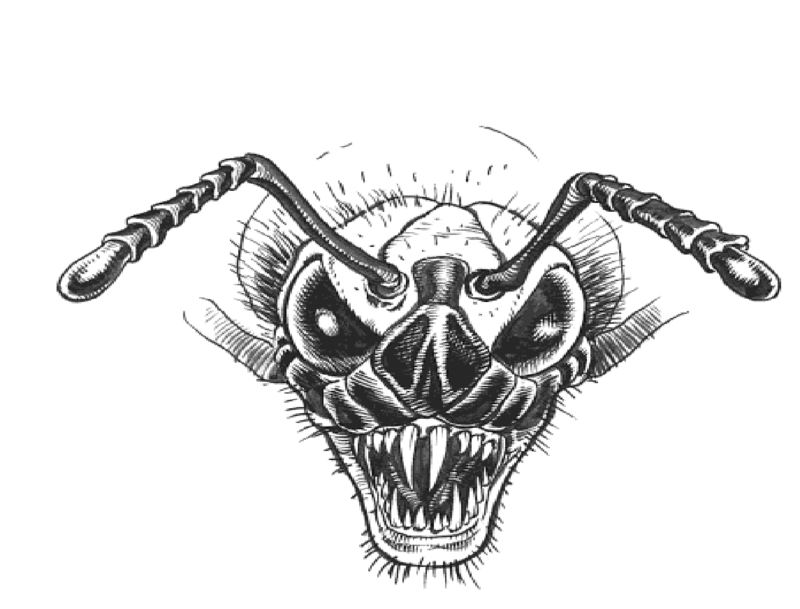 With both characteristic behavior of the Vampire Bat and the Bald Faced Hornet are combined, this would make the blood jackets themselves as a very belligerent, and invasive species. Hunting Behavior: They would circle briefly in the air above their prey with frightening speed. Numbers: In the book Killer Species: Out For Blood, Dr. Catalyst had 4 containers filled with thousands of blood jackets, So there was exactly 4 thousand hordes of blood jackets released into Florida. Bite and Sting: They feel like small sharp pricks of pain, stabbing and burning causing intense pain. The Blood Jackets are venomous creatures with a venomous bite and a venomous sting, The Blood Jackets themselves maybe rabid. When Bitten or Stung the venom will course through your veins and will weaken their primary prey. you will feel dizzy, a little nauseous, woozy, and disoriented when bitten or stung. The venom is the same property in the Bald Faced Hornet's sting and will cause the same symptoms to any intruders that are endangering their nest. Nest: They can nest anywhere. In the book Killer Species: Out For Blood, they nested in multiple locations of Florida. One colony nested in a steeple of a church, and another colony nested in an old abandon warehouse. They Shriek louder when their hunger grows. The color of their blood is Thin Streak of Grayish White Gunk.